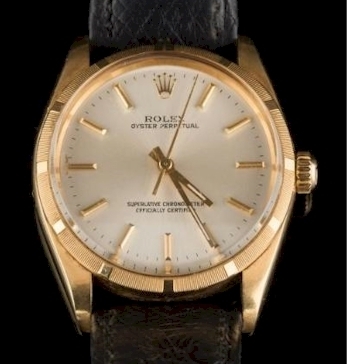 A Rolex Oyster Perpetual Wristwatch (FS34/213), which sold for £1,400 in 2017. Today, a wristwatch is considered a status symbol as much as it is a device to tell the time. The Rolex brand is a good example of this trend. Rolex is globally recognised distributing high quality wristwatches under its Rolex and Tudor brands. In 1926, Rolex created the first waterproof and dustproof wristwatch named Oyster, which featured a hermetically sealed case that provided optimal protection for the movement. By 1931, Rolex had invented and patented the world's first self-winding mechanism with a perpetual rotor known as the Oyster Perpetual. The brand's prestige is built on innovation, precision and functionality and has continued to be at the forefront of the watch making industry.